We had a customer send us their newly refinished Springfield XD Classic for a sight install. Normally we will not install sights on a gun that has been refinished by someone else. You just do not know the quality of the work and what issues can arise. But I agreed to take on this job because it was refinished by a well known company. After unpacking the box and looking at the slide, I would agree that the refinisher knows what they are doing. The matte black coat was flawless and even throughout the slide. It was only after removing the factory sights were it became apparent that even though the refinisher was good, they do skip corners. Above you can see lighter gre area, thats were the factory sights were. The refinisher did not remove the sights when they refinished the slide. The sights acted as a mask and kept the new finish from fully coating the slide. Normally this would be no problem since this is hidden by the sights and you would never see it. The problem is if the customer ever wants to change the sights, the new sights may not cover the same area. Above you can see a front sight from a set of Trijicon HD's. 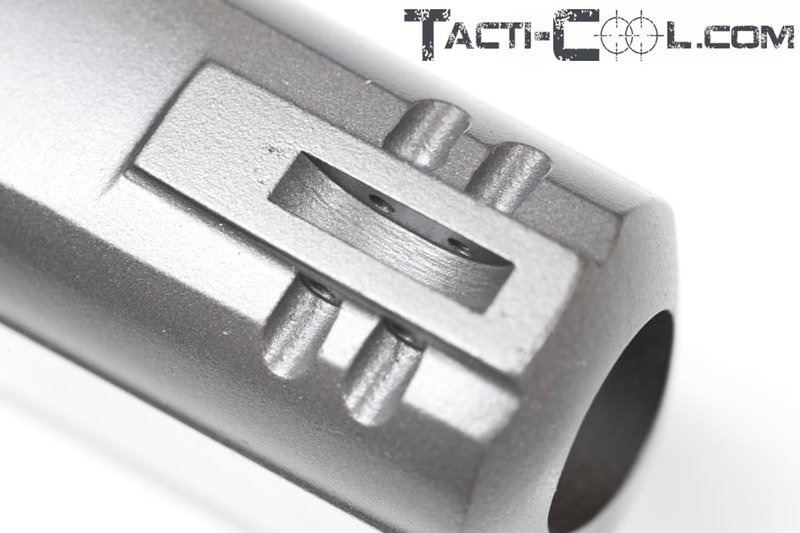 The new sight's blade is not as long as the factory sight and when installed will exposed the non refinished portion of the slide. 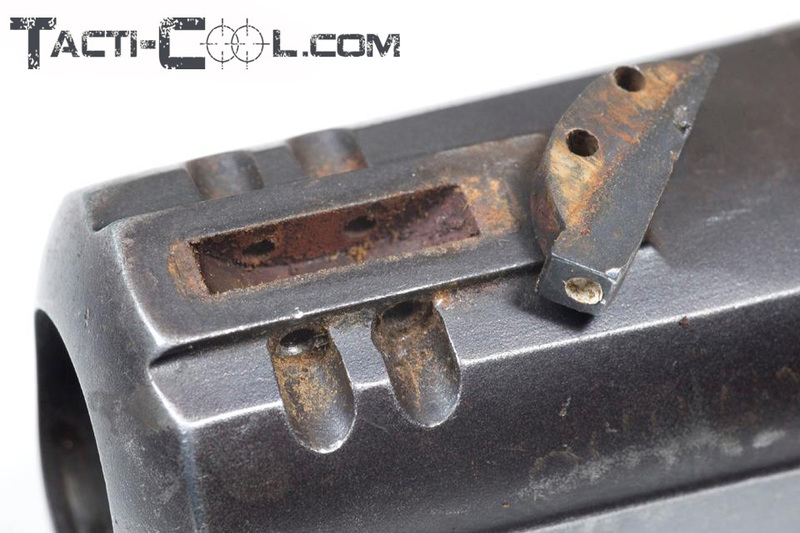 The rear sight was the same and was not removed for the refinish. When I removed the factory rear sight it exposed the "raw" metal. 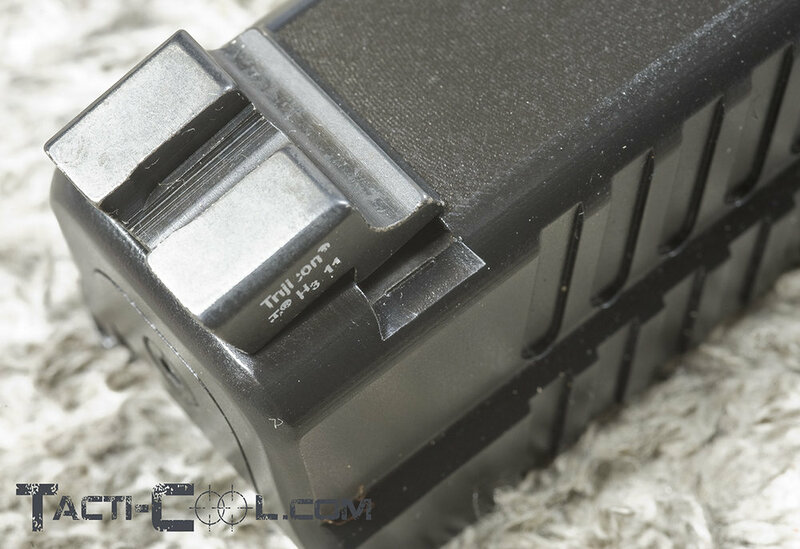 The new Trijicon rear was not wide enough to cover the "raw" area. After informing the customer and sending him pictures the refinisher indeed told him they do not remove the sights and refinish right on top of them. I told the customer I would install the new sights, but it would look bad. He was so mad that the original refinisher did not tell him that they do not remove the factory sights he told me to redo the whole thing. This ended up being a 55.00 fix that could have been avoided by just asking if they completely 100% disassemble the slide including the sights. As a refinisher it is always best to completely disassemble what ever your refinishing. Refinishing is not always done for cosmetic purposes, but may be for protection or repair as well. 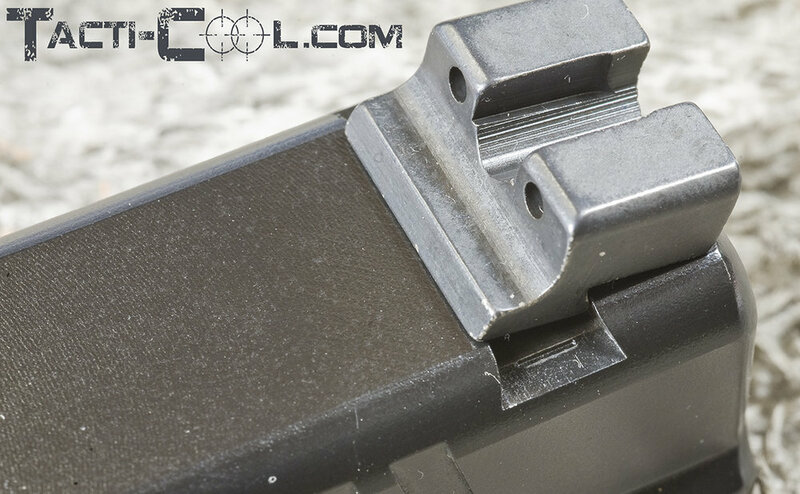 Above the Ruger slide looks like you could just blast the slide and coat over the old sight without removing it. Well look what you find when you do remove the old sight. Years of old crusty rust that would have continued to destroy the slide from the inside out. After completely disassembling the slide, I abrasive blasted the slide removing all traces of rust, then coated it even in the areas that would never be seen. So now there is not a hidden pocket of rust, and the slide is protected inside and out. You would not take your car in for a transmission problem to a brake specialist would you? The same goes for your gunsmith. Ask your friends for recommendations if they have had similar work done. Use the internet and find a talk group that corresponds to your make and model of gun--guaranteed they know who specializes in your firearm. Interview your smith. Do they answer when you call and answer all your questions to your satisfaction? Does the smith have experience on your weapon? I tell people all the time I would rather not experiment on their gun if I have never worked on anything similar before. I have never had a customer laugh at me because I did not know something. In-fact most are thankful at the honesty. Do you remove the sights when you refinish guns?